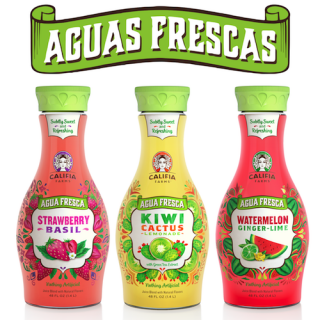 (PRWEB) May 13, 2014 — Califia Farms kicks off summer with the launch of three refreshing Aguas Frescas in Watermelon Ginger Lime, Strawberry Basil, and Kiwi Cactus, available at Whole Foods Market exclusively for the summer. The traditional recipe for Aguas Frescas, or “Fresh Waters,” comprises of fresh fruits or flowers, blended with sugar and water to make light non-alcoholic beverages. Califia’s take on the classic lightly-sweetened Agua is cause for a fiesta as the health-conscious brand’s Aguas use less sugar and clock in at 90 or fewer calories per serving. The timely launch of the new line coincides with summer holiday and festivity planning, as the new drinks complement picnic and fiesta occasions. All three flavors are Non-GMO Project Verified™, an important stamp the bright, festive labels bear proudly. Inspired by Mexican mural art and Día de los Muertos designs, the eye-catching packaging, will invite Whole Foods Market shoppers across the country to experience the sweet, refreshing drinks inspired by South of the Border, but made with a California twist at Califia’s eco-friendly juice plant in the San Joaquin Valley. Califia Farms’ unique approach to flavor shines in the drinks’ exciting combinations, Watermelon Ginger Lime, Strawberry Basil, and Kiwi Castus Lime. The Kiwi Cactus Agua Fresca includes antioxidant-rich green tea, highlighting the more traditional Aguas flavor notes. The versatility of these offerings make them a Spring and Summer party essential: all three varieties come alive as mixers, but kids and non-imbibers at the party can still enjoy the fiesta of fresh fruit flavors and subtle sweetness. Califia’s Aguas Frescas are lighter juice drinks than conventional juices, with the bright taste of watermelon, strawberry and kiwi leading their flavor profiles. Shoppers can find the Aguas Frescas exclusively at Whole Foods Market from May 1 through October in the store’s dairy cooler next to multi-serve citrus juices. Please visit http://www.califiafarms.com/store-locator/ to find Aguas Frescas near you.